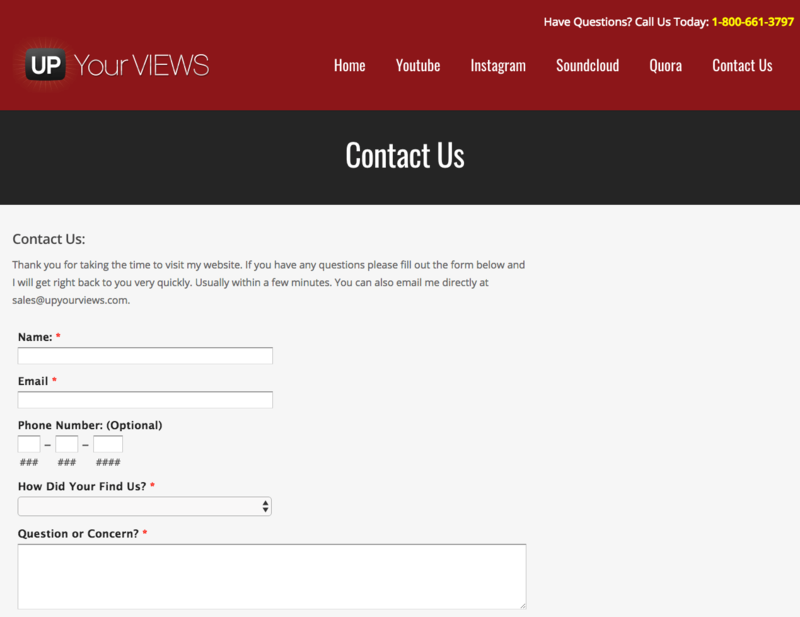 UpYourViews is an American company that started in 2012. They offer different social media marketing services for YouTube, Instagram, and SoundCloud. They claim to deliver real social signals at competitive prices and have 24/7 customer support. Their site has a simple layout, with the service links accessible on the top of the screen. Buyers can customize their orders from the get-go. They just choose which YouTube services to include in the package and the amount for each, then give their video URL. 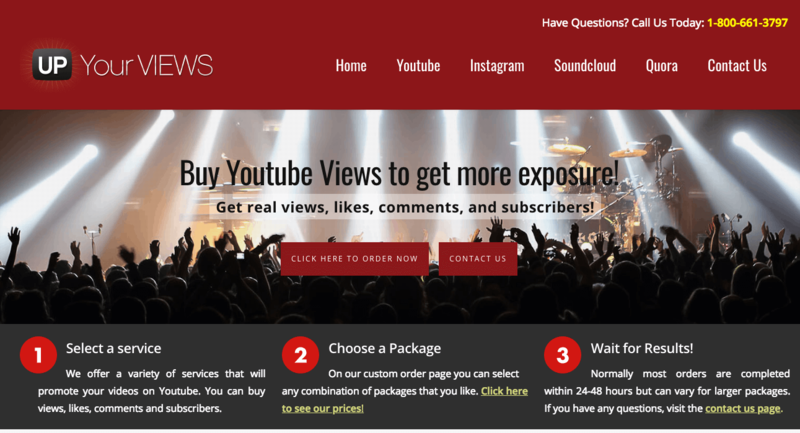 UpYourViews accepts PayPal payments. Customers can ask for refunds if they don’t start receiving their views within 24 - 72 hours. The site adds that they replace lost views, but don’t mention how long the warranty is valid. People can ask questions about these guarantees and other matters through a live chat panel, a contact form, and phone (1-800-661-3797). UpYourViews says that all the views they deliver come from real people, claiming to use different social media marketing tactics to attract them. The site offers only up to 20,000 views and doesn’t provide specific details about them. They start delivery within 24 - 72 hours after receiving your orders. Aside from views, the company has the following services. 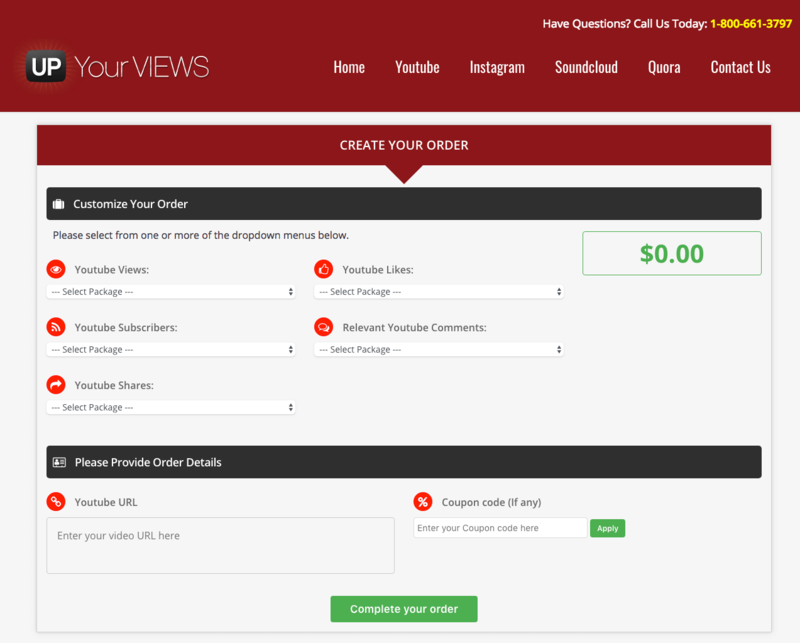 We like UpYourViewes’ custom ordering process since it’s easy to tailor your purchase to specific needs that you may have. Their prices are on the higher end of the average range for most companies and their packages are not as large as others. Their customer support doesn’t help the situation and is unreliable when answering inquiries about their services and guarantees. We suggest that you take a look at our list of reviewed companies to find better options. Do you agree with our assessment of UpYourViews? Tell us your thoughts below.